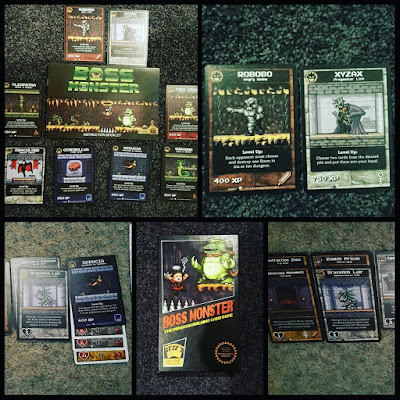 Boss Monster: Always eager to try a new purchase and the opportunity presented itself for a few two player games of this retro inspired simple engine builder based on old school video games. I love the 8-bit NES style artwork and its also nice to play the villain every now and then! While simple there is definitely strategy involved and after a few plays I've now got the sequel in my sights. P.s In a two player game, make sure you don't get Robobo! Splendor: A couple three player rounds of this classic. I've said lots about Splendor in the past and after a good 20 plays I still enjoy it just the same! Coloretto: First time playing this newly acquired classic card game. Quick, fun, easy to learn, easy to teach and something most people would be able to play and enjoy. There's not a whole lot of depth or choices to make but I enjoyed our few games of Coloretto enough where I'd play it again with a group of lighter gamers. Boss Monster: The Dungeon Building Card Game: As already mentioned above, this is a throw back to 80's videogames in the form of a basic engine builder that wins you over with its nostalgic charm. This was actually given to me as an unexpected present and it was an excellent choice! It ticks most of the boxes and while nothing amazing is a very solid choice to have in the ever growing library.